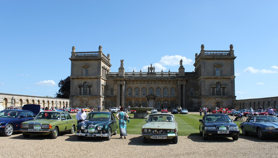 This year the Spalding & East Elloe Classic Car Club Run is visiting the counties of Lincolnshire, Rutland and Northamptonshire. As usual on the route we will be passing through some very pleasant villages, countryside, and places of interest. We have a route of approximately 75 miles on mainly country roads. We hope you will be interested in joining us on this our annual event. The start venue is The Baytree Garden Centre, Weston, Spalding, Lincolnshire, PE12 6JU where you will be welcomed with tea, coffee and biscuits. Registration will open at 9am with cars starting to leave at approximately 10am. If you require a full breakfast, please pre-order directly with the restaurant at Baytree by calling 01406 370242. Lunch is at The Barnsdale Hall Hotel, where there will be a pre-booked carvery, priced at £15.95 per person, served in The Lakeview Room (www.barnsdalehotel.co.uk). Eating in is highly recommended as the Lakeview Room has an enviable position overlooking Rutland Water. For those who wish to picnic, there is limited space within the dedicated car park. The finish venue is Deene Park (www.deenepark.com). The house has been developed by the Brudenell family since 1514 from a medieval manor into a Tudor and Georgian mansion. The most flamboyant member of the family to date was the 7th Earl of Cardigan, who led the Charge of the Light Brigade at Balaklava and of whom there are many historic relics and pictures on view. The entry fee includes reserved parking plus access for two people to the grounds, and gardens. If desired, entrance to the house is discounted to £3.50 per person, payable on the day. As usual we will present the "Car of the Day" award, voted for by the entrants for the car they would most like to take home. The winner will receive a trophy to keep and free entry into next year's event. The "Lyon's Pride Trophy ", awarded in memory of Alan Lyon, will also be presented; this award is decided by the organising committee.